So, as I am sure that some of you astute readers of mine have noticed, this is one of the books that I got last month when I was in Chicago. 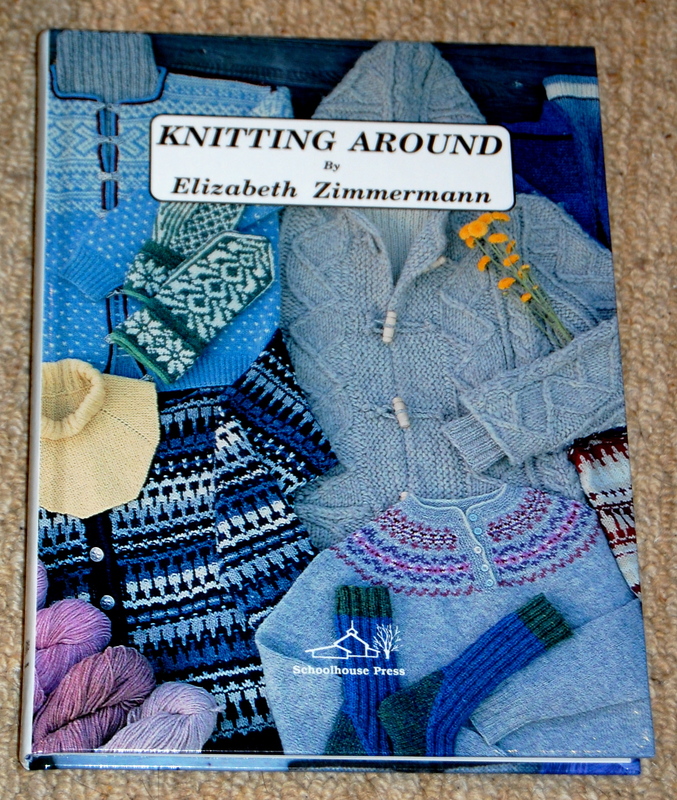 I think that I now have all of Elizabeth Zimmermann’s published books. Knitting Around is part knitting book, part personal history with both parts deeply interwoven by EZ’s distinctive writing style which is one part instructional and many parts conversational. Reading any EZ book is like having a talk with a good friend about life and knitting. The patterns are all written in the EZ style, meaning that you can adapt them twenty ways to Sunday and more than likely, no two of any pattern will ever approach being the same. The reason for this is simple, EZ wanted knitters to master knitting and not patterns, a goal I am fully behind. As a person who approached knitting from a crochet background, it has always irked me how slavishly knitters seem tied to their patterns. But EZ tried to break that habit with some very unconventionally written knitting books. I mentioned at the beginning that this book is part personal history and that was (quite honestly) the part that I found most interesting. She predates her own birth to tell us about the family that she was born into, giving us an interesting picture of the family that she was born into. Then, going through her childhood as the oldest of 3 daughters, she tells the tale of her life through the war and her courtship to a German man. EZ then moves into her life as an immigrant to the US and the difficulties that she and her small, then larger family faced. Finally, we come to the schoolhouse, which is still the centerpiece of Schoolhouse Press, the business that her daughter Meg still runs to this day. It’s a fascinating story and one that makes me glad for purchasing the book, even if I never knit a single pattern in it. I give Knitting Around 4 and 1/2 yarn balls.